If your computer screen gets locked abruptly and you see a half English, half French ransom warning, your computer may be under attack by Trojan.Lockscreen.OJ, which is a dangerous threat you cannot take lightly. This Trojan horse infection is a screen locker, i.e., it blocks you from using any of your programs or doing anything on your computer as a matter of fact. All you are left with is the threatening message on your desktop. Most users get scared and pay these criminals without a second thought. However, we advise you against it. While this Trojan looks very serious about its “business,” we can tell you that it does not cause as much damage as it may seem. Nevertheless, if this malware infiltrates your system and locks it, there is not much you can actually do even if your files do not get encrypted with an impossible-to-crack code. If you want to get your computer and files back, there is only one solution for you: You have to remove Trojan.Lockscreen.OJ immediately. But before you rush to Control Panel, let us tell you that it would be a futile attempt because, as we have already said, you cannot run anything in this condition – not that you could delete Trojan.Lockscreen.OJ that way anyway. 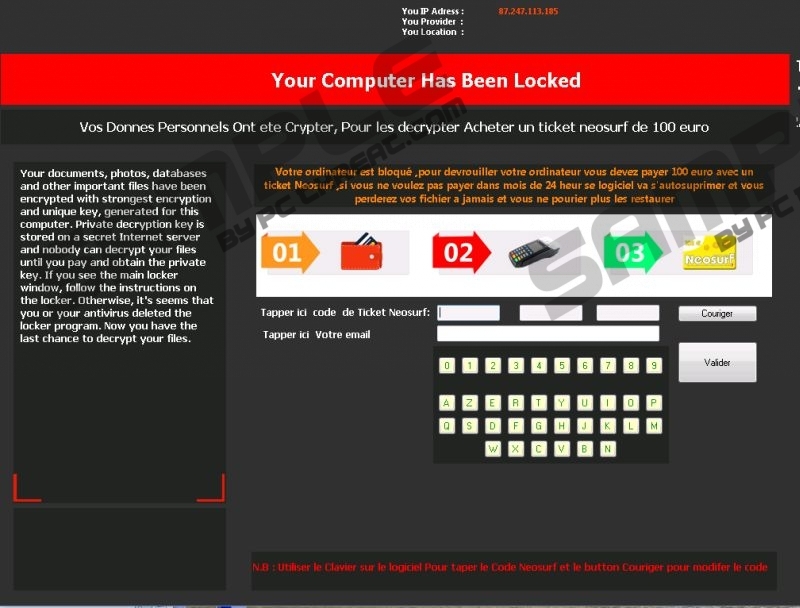 We assume that this Trojan mainly targets French speaking countries because, as a matter of fact, half of the warning message is in English and the other half is in French. But since the part that is about how to pay the ransom amount, which is 100 Euros by the way, it is quite likely that this threat is aimed at French speaking people. However, that does not mean you are safe no matter where you are at on the planet. As you may have noticed, the Internet has no boundaries. In fact, nobody is safe from this Trojan infection since it most commonly uses spam e-mails as a source of infection. Most users are bombarded with spams every day. Of course, nowadays the defense of mail servers and providers are a lot more sophisticated than it used to be. But a few spam e-mails may still hit the Inboxes. It is also possible that you do not even realize it is a spam because the sender may be imitated. In the case of some Trojans it is enough for you to simply open the mail and a script activates the installation right away. In order to get infected with other Trojan infections, you need to click on the attached file, which may be a video, a picture, or a document. Be careful when you open Word documents, for example. If the file asks for you to enable scripts or macros, you should be really certain that this file was sent by a reliable source. Otherwise, you may just let this serious infection on-board. But if you are already infected, removing Trojan.Lockscreen.OJ is the only way out of this nightmare. Once it silently installs onto your system, it alters your file settings to make them “hidden.” This kind of behavior is quite unique because most Trojan screen lockers and ransomware programs actually encrypt your photos, videos, documents, and databases so that you cannot use them again. But Trojan.Lockscreen.OJ does not do that. Instead, it says it does. Since you cannot run any application while being attacked by this Trojan, you cannot even check if the claims are true or false. The warning message this Trojan displays over your desktop background is supposed to scare you enough so that you pay without hesitation. However, we have a solution for you out of this miserable-looking situation. Obviously, you cannot remove Trojan.Lockscreen.OJ manually. In this situation there is one thing you can do to your computer: reboot it. But this time you need to restart it in Safe Mode with Networking. This way you can avoid this Trojan horse from blocking your access to your programs, so you can easily launch a browser and download an effective weapon, such as SpyHunter. Of course, you can use any other reliable malware removal tool of your own choice. Please follow our instructions below in order to save the day and revive your precious computer. Press Win+I to access the Settings Charm bar. Tap and hold the Shift key while clicking Restart. Tap F5 to start up your operating system in Safe Mode with Networking. Open your browser and type in: http://www.pcthreat.com/download-sph. Download SpyHunter and install the application. Execute a full system scan. Remove all malware from your computer. Restart your machine in Normal Mode. Restart your OS and tap the F8 key once the BIOS loads. Launch your browser and type in: http://www.pcthreat.com/download-sph. Quick & tested solution for Trojan.Lockscreen.OJ removal.